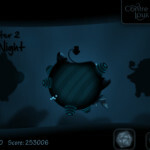 Welcome to the strange world of Contre Jour, it’s full of eyes! 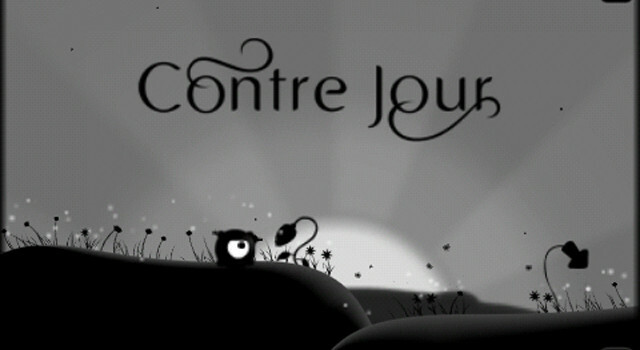 Contre Jour is a game where the aim is to guide your little orb ‘Petit’, who happens to be a large eye, to the level exit, while avoiding death and collecting lights along the way. 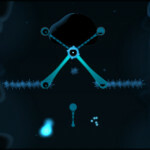 The presentation is beautiful with simple, but elegant graphics and a soundtrack that fits perfectly. 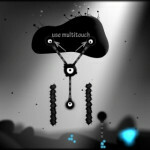 Game play wise it borrows from a few different popular recent releases and mixes them all into one. 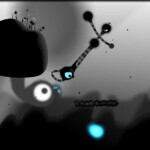 Firstly you cannot control your orb, but you can manipulate the ground around him, creating bulges and dips to get moving. You can also attach string and elastic to Petit. 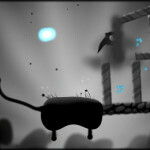 You can even use a catapult to fire him across the screen (no green pigs, thank god). There’s a very high attention to detail here, I like spotting the little things in games. Like the blades of grass that wave about as you manipulate the ground beneath them then slowly settle. 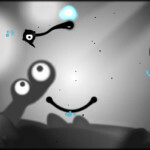 The way you can interact with some of the eyes in the background, which doesn’t affect game play whatsoever, just there if you want to let out some aggression. Each world you follow through has a different them, the night world is particularly interesting with a completely different colour scheme. It mixes things up, but never loses its style and appeal. There are 20 levels in each world and at the moment there are three worlds available, but there is another already on it’s way and who knows after that. 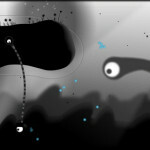 While the game does provide plenty of challenge, especially in the later levels. It isn’t so tough to the point that it becomes infuriating. You often just need a steady head and to think about the level and you can normally get yourself through without too many deaths. You’ve of course also got access to leader boards, you can tell how high you are in the world, nationally or locally. Or of course you can see who has the best score out of your friends. 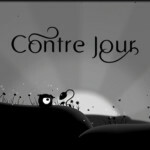 Contre Jour is elegant in design and a joy to play, offering just the right amount of challenge. While currently it does feel a little short, there’s plenty of room to grow. Available now on iOS platforms.